Captain Anton Koffield is a legend - the man who killed a world. Years later, he finds himself stranded in the future, not once, but twice, a span of over two hundred years. This is a difficult book to sum up. It's a space opera, but it reads like hard sci-fi. The character development is superb, He's a haunted man who made an impossible choice and lived to regret it. Ostracized by the very people who should have hailed him as a hero, Koffield finds a job with Oskar DeSilvo, an egoistic scientist whose work has all been plagiarized from a long-dead expert on terraforming. The colony of Solace is dying. Their world's terraforming has begun to fail, and only the information that Koffield has brought them can save them. But he's arrived too late, victim of an unknown enemy. 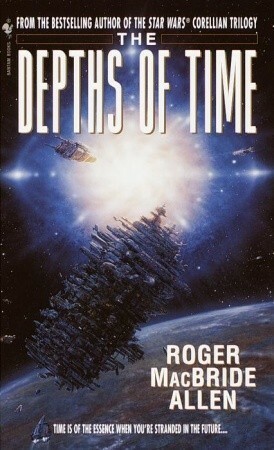 In a mind-bending twist on time-traveling, Roger MacBride Allen creates a fascinating story. Sadly, this is the first in the series, and I have yet to read the second and third. But THE DEPTHS OF TIME is a fascinating take on space travel as well as a multiplicity of other science fictional subjects.